We are always looking for new items that address customer needs and have found the 10-pack paper rolls to be a popular item among small businesses. 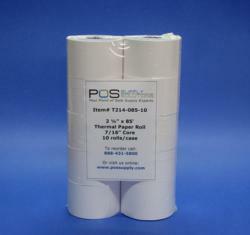 POS Supply Solutions, Inc. (POS Supply) now offers 10-pack paper rolls as part of their comprehensive line of point of sale supplies. POS Supply’s 10-pack paper rolls come in fourteen different sizes and grades of thermal roll paper, 2-ply carbonless roll paper and white bond roll paper. These are ideal for restaurants, office supply stores, retail shops, service stations, convenience stores, banks, doctors and many others. They are also an ideal solution for credit card and cash register dealers who are looking for a cost effective way to provide their customers with paper rolls to go along with their terminals. These packs are also perfect for businesses that run fewer transactions and would like to have the option to purchase less than 50 rolls per case to save on inventory space. All of POS Supply’s paper roll products are designed to deliver high performance and compatibility in all common transaction printers while minimizing the user's total cost of ownership. Customers can order 10-pack paper rolls from POS Supply Solutions with total confidence that they are receiving premium quality products at a great price. POS Supply Solutions provides point of sale and transaction supply solutions, serving a full spectrum of hospitality, retail, financial, gas station, medical, wireless and business transaction applications. Established in 1999, POS Supply Solutions’ corporate facility is located in Danvers, MA with distribution warehouses strategically located across the United States. Over the past 12 years, POS Supply Solutions has worked with thousands companies to ensure they receive the point of sale supplies needed for successful and efficient business operations.